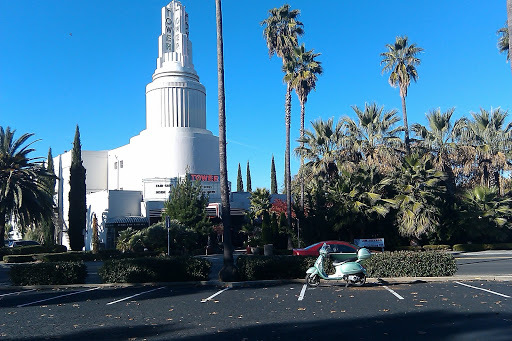 The Tower Café [http://www.towercafé.com/], located on the corner of Broadway and Land Park Drive, is quite a success story. Surrounded by struggling ventures it continues to do excellent business while its namesakes have not fared so well. Tower Records, Tower Books, and Tower Videos are now gone and Tower Theatre, which it shares the same building is currently for sale, and struggling. Back when I worked for Tower Theatre in the early 80s the owner of the adjacent Tower Pharmacy turned what appeared to be a respectable business into a failed café. The new owners kept the name, but changed everything else. The Tower Café is now a huge success. This largely had to do with the owner’s smart business sense and youthful exuberance. I have been to the Tower Café quite a few times for breakfast, lunch, and dinner. I have always enjoyed the Tower’s burgers. The one burger I have never tried is the All American Burger. The Tower’s eclectic décor and menu always discourages me from ordering an “ordinary” item. All the Tower Café burgers, except for the vegetarian offerings, include charbroiled 1/2 lb. ground chuck patties, onions, lettuce, and mayonnaise, most of them come with a slice or two of tomato, and all are served on a sesame bun. Here is the breakdown on these interesting burgers. 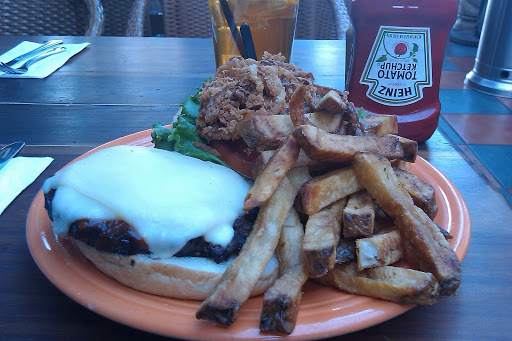 The Borracho Burger comes with Firestone Double Barrel Ale BBQ sauce, which adds a little smoky heat to the meat. The burger is topped with crispy onions that give the burger a delightful crunch along with the robust taste that comes with combining onions and beef. The high stack of fried onions makes the burger a little too tall and the sauces can be a messy, but the combination is worth the challange. 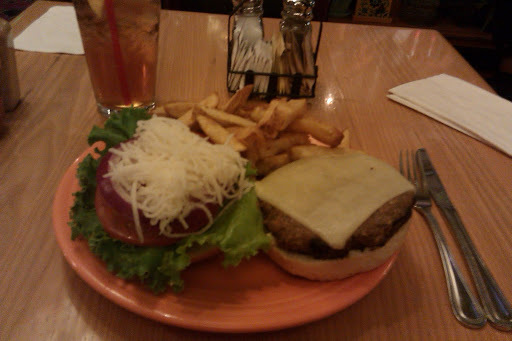 The Kona Burger is an excellent combination of the sweet and savory. 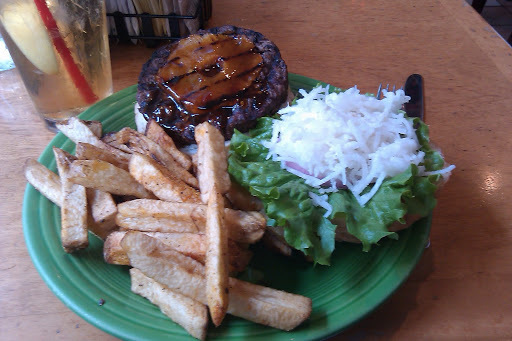 The patty has a hoisin-ginger glaze with a manageable slice of grilled pineapple topped with jicama. When I order a burger at the Tower Café, I struggle over whether to enjoy the smoky Borracho Burger or the juicy Kona Burger. It is a tough call. Less imaginative, but still enjoyable is the Jerk Burger. The sauce and the jack cheese make it a clear winner over the All American, but a distant third over the Borracho and Kona. When one strips the Tower Café’s burger down to its base you find it is not remarkable. The All American Burger has the charbroiled 1/2 lb. ground chuck patty, tomato, onions, lettuce, and mayonnaise on a sesame bun, which all the other burgers have, but the others have distinctive tastes that mask the unremarkable base. While there is nothing spectacular about the beef or the rest of the fixings that are common to a cheeseburger, it is the unique elements that make Tower Café burgers like the Borracho, the Kona, and to a lesser extent the Jerk burger very good, and the All American nothing special. So if the spirit of the café does not make you try something unique you may be disappointed. The fries that come with the burgers are delicious, despite the fact that they are steak-style. The fries are seasoned, and very crispy. The Tower Café offers potato salad instead if for some crazy reason you do not like fries. The Tower Café also features the Earth Burger which is a vegetarian selection with a patty made of nuts, rice, and their East African Veggie Burger made of ground peas, sweet potato, garbanzo beans, and corn mixed with spices and encrusted with pumpkin and sesame seeds. I did not sample these. All the burgers run about $10-11. There is no price deference between the lunch and diner menu.